2. To increase staff product knowledge and customer service competency. We pushed the brand look and feel and created some basic guides, using their existing concept of coloured triangles and the PrintShop logo. This was then rolled out across in-store and public promotional materials including outdoor signage, print ads, flyers and digital advertising. 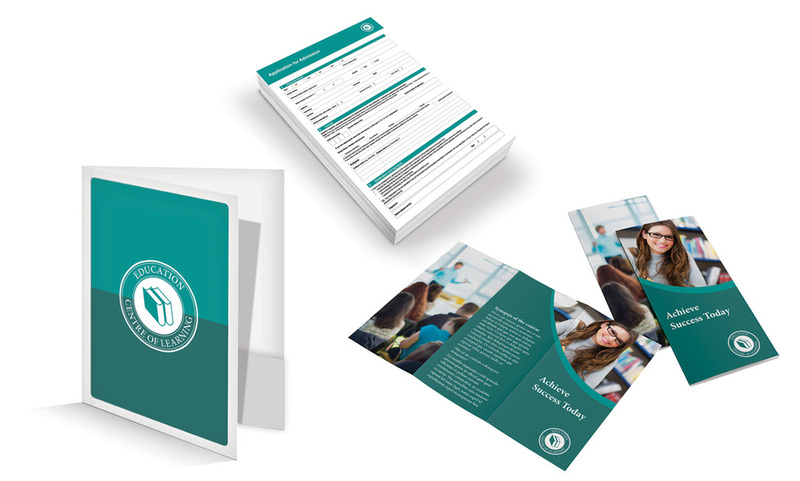 The PrintShop Solutions Pack concept was a way of simultaneously creating flat artwork templates, mocked up 3D example images for promotional pieces, and physical examples to educate staff and inspire customers starting a small business. We created five pretend generic brands across five broad industry examples: hospitality, hair and beauty, education, trades, and real estate. These were rolled out to physical collateral relevant to each one. Each PrintShop store was provided with a booklet showing all collateral, a USB with template files showing how each artwork is set up for print, a diagram linking these and describing optimum paper weight, size, print specs, and some physical examples for display. Lead design: Industry Solutions Booklet; Trades and Hair and Beauty brand concepts; collateral rollout for all industries; PrintShop stationery; and promotional eDM.